Knowing our farmers reconnects us with our food. And knowing our food increases the value food has in the health of our bodies, the soil and the economy! Building a regional and equitable food system is the best way a community can support local agriculture because it opens up new distribution outlets for small farms helping them diversify their business and feed our neighbors. Tahoe Food Hub is a non-profit organization that is building a regional food system in North Lake Tahoe, by taking advantage of its close proximity to year-round food production. Their plan is to increase the availability of nutritious, ecologically grown food, by connecting small farms within 100-miles of North Lake Tahoe to restaurants, small grocers, schools and hospitals. For more info, visit www.tahoefoodhub.org. 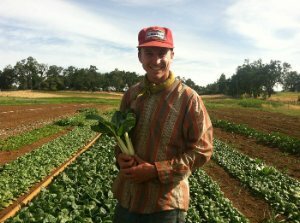 The Sierra Agroecology Center (SAC) is a program of the Tahoe Food Hub and is educating our mountain community about agriculture in an alpine ecosystem. Community members and school children learn about the importance of local food and sustainable farming practices, as well as the ability to further increase our own food security by growing food locally in the mountains using 4-season growing techniques. The Growing Dome is the center piece of the The Sierra Agroecology Center (SAC) and allows places like the Sierra to grow year-round. Surrounding the Growing Dome are outdoor cold frames which demonstrate that with limited space and resources, anyone can extend the season and grow in their backyard from March to November. We outreach to local schools and host tours and workshops for grades 3rd to 6th. We offer different lesson plans which integrate with California’s Common Core Curriculum using”Next Generation Science Standards.” It provides a hands-on compliment to what students are learning in the classroom. Systems-based approaches to learning are very effective in helping students better understand science and make connections to the relationships we share with our ecosystem. The Sierra Agroecology Center (SAC) also features beehives, chickens, different permaculture techniques and a compost program. Inside the Growing Dome, there is an aquaponics system. Aquaponics is a great way to explain how an ecosystem works because it is a demonstration of a closed loop cycle…fish feed the plants and the plants clean the water for the fish. No soil required!